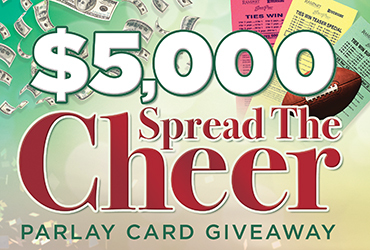 Guests earn one entry to our Spread the Cheer Parlay Card Giveaway for every $10 parlay card bet in the Sports Book. Cash drawings will be held every Thursday, December 1, 8, 15, 22, & 29. The drum will be emptied each week immediately following the drawing. Visit the Rampart Casino Race & Sports Book for complete details.